MISSION SUNDAY EDITION for Twenty-First Week after Pentecost (oct2015c.htm) featured on The DailyCatholic, a Traditional Catholic publication dedicated to perpetuating the One True Faith and preserving the Traditional Latin Mass in this time of the Great Apostasy by upholding the sedevacantist syllogism in order to Save All Necessary Catholic Traditions in the United States (SANCTUS) and preserve the Truths and Traditions of the Church founded by Jesus Christ upon the Rock of Peter. Fr. 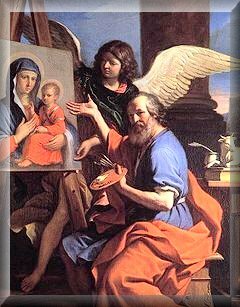 James Wathen: Language of the "New Mass"
This year the feast of St. Luke the Evangelist supersedes the Twenty-First Sunday after Pentecost which is also Mission Sunday. 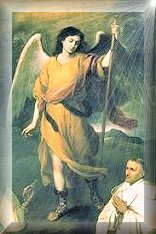 While the purpose of this Sunday has been greatly de-emphasized by the new order CONciLIAR cabal, it should be made all the more important in traditional circles for we are the last line of defense of the one, true, unadulterated Faith instituted by Jesus Christ and passed down through His Apostles and their legitimate successors through the death of His Holiness of happy memory Pope Pius XII whose 57th anniversary of his passing we observed a few weeks ago. Thanks to today's technology we can reach all four corners of the world. We can be the missionaries Our Lord asks us to be through the help of His beloved Immaculate Mother Mary who bestowed on mankind both the Holy Rosary and the Brown Scapular; the former being one of the most powerful weapons possible against the slings and arrows of the world, the flesh and the devil; the latter a potent shield of protection as St. Paul's metaphors point out in Ephesians 6: 10-17. 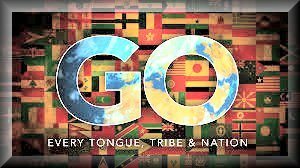 We can be the missionaries God expects us to be by following Paul's counsel in the next two verses of Ephesians "By all prayer and supplication praying at all times in the spirit; and in the same watching with all instance and supplication for all the saints. 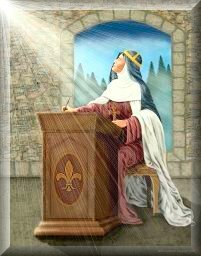 And for me, that speech may be given me, that I may open my mouth with confidence, to make known the mystery of the gospel. For which I am an ambassador in a chain, so that therein I may be bold to speak according as I ought." 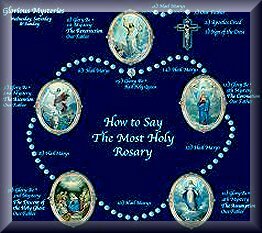 This is the month of the Most Holy Rosary and we've been building towards this month as we continue each day a chapter from St. Louis de Montfort's "The Secret of the Rosary" which we complete in this edition. 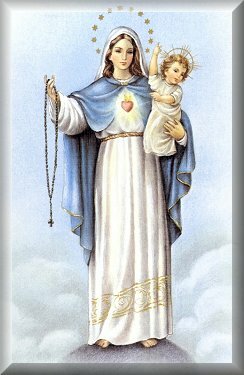 In addition, throughout October we endeavor to bring you a daily sermon tying in with Our Lady and the Holy Rosary or a special feast, all courtesy of Traditional Catholic Sermons . If ever we've needed Our Lady's help through storming Heaven with Rosaries, it is now. With the Islamic threat, with the fear of war not only in the mideast, but on our borders and, actually, everywhere, and with the increase in persecution of believers in the Holy Trinity, and especially Traditional Catholics being denigrated by the Marxist Argentinian who heads the false CONciLIAR church, well, the answer is to do as St. Paul advises in 2 Thessalonians 2: 14 and stay with the traditions we have learned. One of those traditions bestowed by Heaven 801 years ago is Mary's holy psalter and, as proven through the annals of Church history, has been one of the most powerful weapons we could ever have. The problem is we're not using our full arsenal that Heaven has given us. 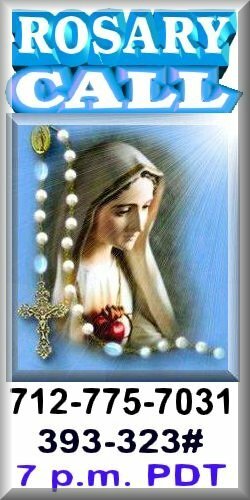 The Mother of God urged us to pray the Rosary at Fatima. 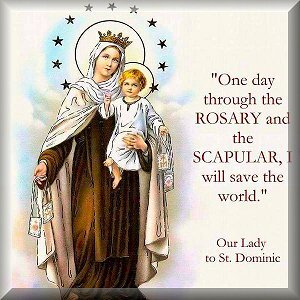 We know from St. Louis de Montfort the power of the Rosary. 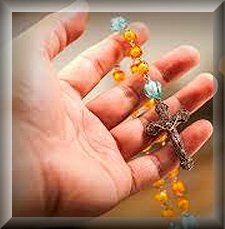 We know from Lepanto how praying the Rosary can overcome all odds, yet how many are using this simple, effective weapon that is, as stated above, more powerful than any bomb, gun, cannon, axe, machete, flamethrower, bow-and-arrow, sword, slingshot, or you name it. 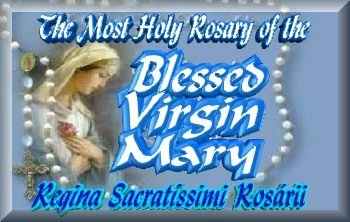 The fact is no human weapon is more effective than the Rosary. And you can carry it anywhere and use it anytime. Any questions? 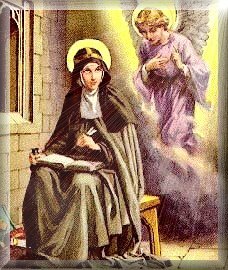 Then take up thy Rosary and fire away. 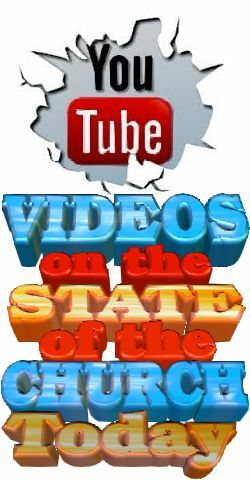 We are now in the final week of what Novus Ordo Watch properly calls Vatican III, more specifically the so-called "Synod of the Family" which is really a SIN-ODD from the heresies that have so cleverly evolved where now they are out-and-out blatant. For everything you need to know about this sacrilegious blasphemy going on in Rome, see Complete Coverage and commentary on the Synod. Despite what is going on, the Resist-and-Recognize camp still cling to calling him "Pope". Someday, someway, somehow they will awake from their slumber. They will raise their necks from the sand and voila, they will realize sedevacantists have been right all along. Pray for that day. We're reminded what Jesus said in St. John 15: 18-19, "If the world hate you, know ye, that it hath hated Me before you. If you had been of the world, the world would love its own: but because you are not of the world, but I have chosen you out of the world, on account of this the world hates you." We can see how those who have no love for the true Catholic Church fawn over Mr. Bergoglio the unFrancis just as Our Lord foretold and what holy scriptures portend in Daniel 7: 25, Galatians 1: 8-10, 2 Thessalonians 2: 3-11, 2 Timothy 4: 3-4, 1 John 2: 18, 22, Apocalypse 13: 5 not to mention chapters 17 and 18. 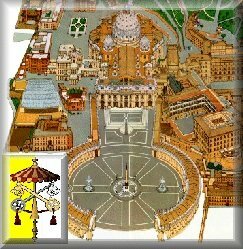 Mr. Bergoglio the unFrancis has gone beyond the pale where even more secular voices are asking "Is the pope Catholic?". We answer with a resounding "No!" and every time he opens his mouth that becomes more and more evident to even the uneducated. No wonder he hates true Catholicism so as we continue to expose the Great Apostasy fostered by Vatican 2. Continuing his humanistic live-and-let-live, live-by-the-golden-rule platitudes, never did he proclaim Jesus Christ as necessary for salvation. Never did he proclaim the only way to true peace is through the Social Kingdom of Christ as our Sovereign King. No, it was all temporal that at times in his political correctness seemed almost pantheistic and whenever he did refer to the Lord it was for things Jesus did to help someone temporally. Not once did he reference St. John 8: 11, "Go, and now sin no more" You see Mercy is two-fold. If we are to expect God's mercy, then we must be willing to amend our lives. That part of it was missing. No surprise because Bergoglio, the worst of the worst, preaches to go by one's conscience and that one's Catholic faith is not that important, as long as you have food and water. He is humanistic to a fault and trying with all his might to make it more difficult for true Catholics and easy on pseudo-Catholics and non-Catholics. Keep in mind Our Lord's words in St. Matthew 12: 8-9, "And I say to you, Whosoever shall confess me before men, him shall the Son of man also confess before the angels of God. But he that shall deny me before men, shall be denied before the angels of God." Typical of this Marxist Modernist, who couches his platitudes in the heresy of relativism, he has so duped the majority of souls and will do even more damage with the upcoming Synod in Rome which more appropriately should be spelled SIN-odd since it is not only odd, but totally antithetical to call a democratic summit to talk about easing Catholic restrictions that have alway been upheld. 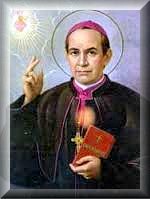 This SIN-odd grew from Jorge's own acceptance of mediocrity and his statement that "we must be more lenient toward homosexuals, couples using contraception and living together outside of marriage, and the divorced" bodes toward a total liberalization of the Modernist church. It is a moral implosion that threatens more souls by making life on earth easier, yet much, much harder to get to Heaven, even if they can receive the wafer and CONciLIAR kool aid. I guarantee it won't help souls. God's not for it, satan loves it. That tells you everything. To many it would seem the gates have shackled what to the world appears as the Catholic Church today. We know that is impossible because Christ prommised that would not happen. 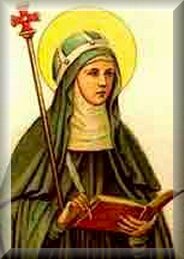 Therefore, it is only logical to syllogize that the church posing as Catholic is nothing but an evil imposter intent on stripping her of all semblance of Catholicity. Yet so many remain blind, deaf and dumb to it all, going along to get along without realizing how wrong they are and how they will have to account for their actions or inactions at their Particular Judgment when it will be too late to make excuses or say 'I didn't know'. 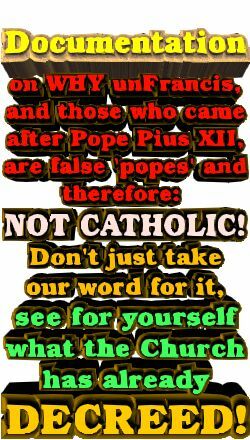 That is why we have continued to publish the DailyCatholic and link you to reliable, trusted sites so you can't say you didn't know. Yes, it means leaving the comfort zone you've erroneously grown accustomed to, but it's time all realized that we owe our allegiance not to men who violate the Faith, but to God and all that His holy Catholic Church passed down from Peter through the last true Pope - His Holiness Pope Pius XII of happy memory. Since then the wolves have invaded and engulfed souls in their wicked jaws. 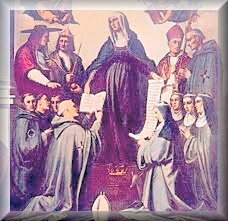 The six imposters you see here could never be true Popes as previous true Popes have decreed as is documented to the right. We've documented before many of the bizarre things he's said off the hip and formally that the world takes one way while Traditional Catholics see through the veneer and can peg his agenda so clearly. That's another reason he has targeted Traditional Catholics many times in derisively calling them "neo-pelagians" and worse. He can't touch sedes, so he focuses on those who subscribe to the Recognize-and-Resist camp. 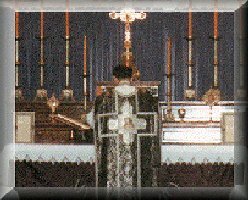 We've seen his hatchet job on the Franciscans of the Immaculate last year and now the SSPX. Do those who cling to the Society really want to align with these apostates? Puhlease. When, oh when will those in the Recognize-and-Resist camp wake up to the fact UNfrancis can't possibly be a true pope, let alone even be Catholic? His tactics are the way liberals and Marxists operate as is obvious from his humanist ridiculous, sacrilegious eco-cyclical and catering to Islam. But then, as he and his ilk proffer so humbly (yeah, right! ), who wouldn't agree that we must not be concerned with "small-minded rules"? Those are supposedly passé in today's world. Who should want those? Every true Catholic worth their salt, that's who. And those who still remain Recognize-and-Resisters had better realize that the world loves to hear this. Shouldn't that tell everyone, who has ears to hear, that he is anathema, and worse, quite possibly the antichrist; definitely a precursor to thee antichrist. 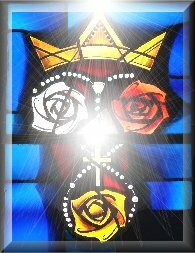 When you discover what the True Church teaches you'll realize that ever since the death of His Holiness Pope Pius XII , the Catholic Church hasn't been the same. That's right, and Jesus tells us why. 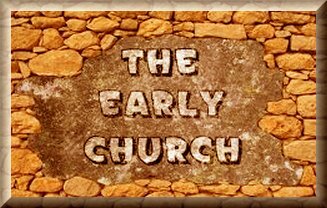 Because what poses as 'Catholic' today, governed by those usurping the authority in Rome and dioceses throughout the world, is a false church - an arrogant, out-of-control, failing man-made religion that has eclipsed the humble true Church consigned in these times to the catacombs. 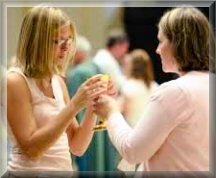 Jesus identifies these proud modedrnists who have eclipsed the true Church quite clearly in St. Matthew 7: 15 that we must beware of the false prophets who may appear in clothing of sheep, but inwardly we must recognize them as ravening wolves or worse. 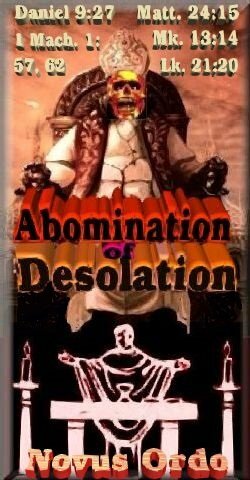 If the faithful couldn't see the "abomination of desolation" (St. Matthew 24:15) and devious destruction of the true Faith during the regimes of the first five imposters since Pius' passing, they should surely see it now as Roman-born Argentine Bergoglio continues his agenda to wipe out any vestiges of Catholic truth that would be offensive to non-Catholics in his Marxist mindset to please man, not God through his humanist efforts to form a One World Religion. If one reads St. Paul's warning in 2 Thessalonians 2: 3-11 and what many would do in 2 Timothy 4: 3-4, we can more readily see what Our Lord meant in St. Luke 18:8 when He asked rhetorically if there would be any one of faith left when He returns. As these sites above point out, the only obstacle to totally dominating as a totalitarian society is the Roman Catholic Church. Always has been. Since the death of the last true Sovereign Pontiff Pope Pius XII on October 9, 1958 that wall of resistance has been steadily crumbling thanks to those with a worldly Marxist bent to accept the world and please man rather than God as is so evident today. 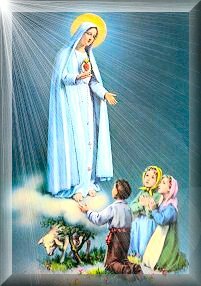 Oh, the devil is laughing, but he seems to forget Genesis 3:15 where the Blessed Virgin Mary will crush his head with her heel. Oh, we can't wait! 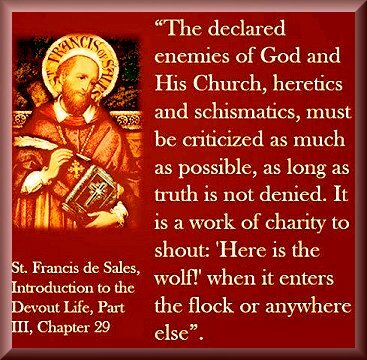 Until then, it's important to expose the wolves just as the holy Doctor of the Church St. Francis de Sales advises for the sake of informing souls of the dangers these charlatans pose. So while the Marxist apostate Mr. Bergoglio the unFrancis continues to proclaim ever so boldly collective salvation through protecting against 'global warming', we must realize each one of us is responsible for our own salvation and we've been given the blueprint before Vatican Two. Guess what? It still works. Guess what else? 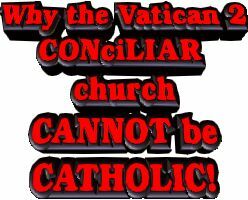 The new-fangled CONciLIAR religion doesn't work. Never will. That is why we find more waking up after praying for the grace to see, truly see, and that is where twitter can be a great means of conversion one soul at a time. 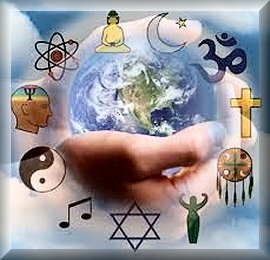 That's why, to paraphrase an axiom in less than 140 characters, brevity is the soul of witnessing as we ask you to follow the DailyCatholic on Twitter After all, it is not 'global warming' we should fear but God's Global WARNING. 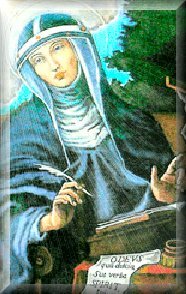 Saint Peter of Alcantara was born in Alcantara, Spain in 1499. His father, Peter Garavita, was the governor of the province, and his mother was of the noble family of Sanabia. 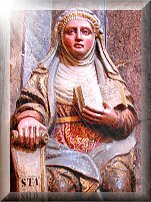 After a course of grammar and philosophy in his native town, he was sent, at the age of fourteen, to the University of Salamanca. 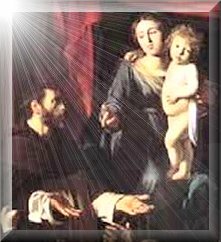 Returning home, he became a Franciscan in the convent of the Stricter Observance at Manxaretes in 1515. At the age of twenty-two he was sent to found a new community of the Stricter Observance at Badajoz. 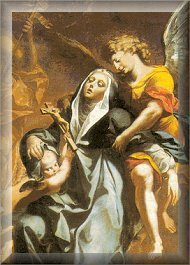 He was ordained priest in 1524, and the following year made guardian of the convent of St. Mary of the Angels at Robredillo. A few years later he began preaching with much success. He preferred to preach to the poor; and his sermons, taken largely from the Prophets and Sapiential Books, breathe the tenderest human sympathy. 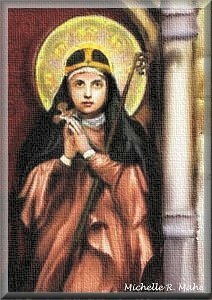 The reform of the "Discalced Friars" had, at the time when Peter entered the order, besides the convents in Spain, the Custody of St. Maria Pietatis in Portugal, subject to the General of the Observants. 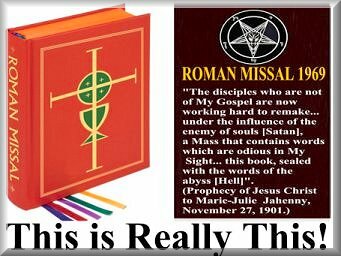 In part thirteen of Chapter Four of his book "The Great Sacrilege" Father James F. Wathen exposed the radical departure of Paul 6 in his Missale Romanum where the reform was so evident in putting on an equal footing the Word and the Eucharist, which is totally Protestant in every way and gives reason why today at least 75% of ConciLIAR Catholics don't believe in the True Presence. But why should they when the Modernists make such a circus of this sacred moment. You can see the difference just in the photos above where the priest, the alter Christus administers the sacred Host on the tongue for none should touch with their hands the consecrated species except for the priest or an ordained deacon, whereas in the new church of Vatican 2, anyone can touch it, do whatever they want and even drink the wine in the cup, as long as a "eucharistic" minister wipes it off. Can't have any germs, while, in truth, the germs for the soul are infecting everyone because of the norms of GIRM. Father showed how Montini and his Missale Romanum was the antithesis of His Holiness Pope St. Pius V's Quo Primum in dealing with The "Communion"
Father James F. Wathen pointed out the great danger of ecumenism, a heresy if there ever was one and a violation of the First Commandment for it was a return to worshipping Baal. He had the foresight to see way back in 1971 what we would be facing in 2014 when the "all should be one" would be so construed as to deceive even the elect just as Jesus foretold and St. Paul warned. But through demonic sources and the "Age of Aquarius" sixties, guards were dropped and seeping in was the slithering serpent where we see today the bitter fruits. Virtue is now vice, good is evil, while vice is excused and merely a victim of those fundamental neo-pelogians as unFrancis so boldly lashed out at the only remnant segment who still cling to the true Faith. It is typical of liberals, progressives, Modernists, Marxists, they're all the same. They will seek to eliminate boundaries and compromise belief, forgetting things of Heaven for the world awaits the New One World Order Religion and the Modernists of Vatican 2 have led the way for the past 50 plus years in apostasy, mainly because of the heresy of "Ecumenism"
In Chapter Twenty-Six of Book One of the Prophesies and Revelations imparted to St. Bridget of Sweden we see where the Angels praise the Lord for three reasons: He created them, all is in accordance with His will, and He created mankind and, of course, the Blessed Virgin Mary. Jesus answers with appreciation for the angelic hosts, but questions them about their gushing over mankind for man has greatly offended the Almighty by his sins and how children would have been born if the first parents had not sinned. Even with that God showed miracles to the people through Moses and later through His Own ultimate sacrifice of Pure Love for us. 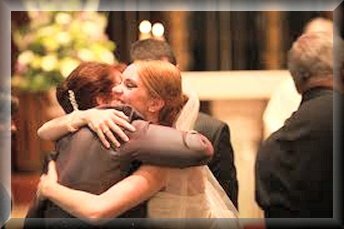 He speaks of the breakdown of the bodily marriage in this time, and the conditions of a spiritual marriage. How pertinent is this at the very same time the CONciLIAR church is trying to relax morals? Jesus has the final say as we see here in What will it take for man to see? The late Father James F. Wathen completed Chapter Four with part fifteen in which he pointed out how the absolutes of the Apostolic canonical Mass of All Ages had been sabotaged with ambiguous language that, as he put it "How few people realize that the very soul of the Revolution is deception and its total objective is influence." We can see today for the masses have, over several generations, allowed themselves to be deceived, herded by the Revolution of Vatican Two closer to the abyss. 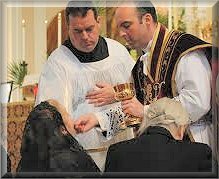 Father pointed out that language played a big part because it was the dialetic direction that duped so many and led to someone daring to violate the entire Liturgy, the heartbeat of the Church and placed it on life support because of the quacks that tried to operate on perfection. 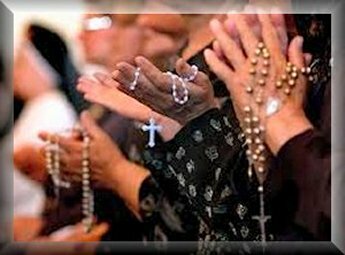 Father explained how this occurred through Language of the "New Mass"
This Prayer to the Patron of the Universal Church was prescribed by His Holiness Pope Leo XIII to be recited after the daily Rosary during October, month of the Holy Rosary.